The four companies, Benjamin Moore & Co., Inc., ICP Construction Inc., YOLO Colorhouse, LLC, and Imperial Paints, LLC, agreed to settle Federal Trade Commission (FTC) allegations that they promoted products as emission-free or containing zero volatile organic compounds (VOCs) during and immediately after painting without having adequate substantiation for making those claims. Some advertisements from the companies also made explicit unsubstantiated safety claims regarding babies, children, pregnant women, and other sensitive populations, such as those suffering from asthma or allergies. The FTC is now taking comment on the Consent Orders for the four companies. The FTC published Green Guides, which are designed to help marketers ensure that their environmental benefit claims are truthful and non-deceptive in accordance with Section 5 of the FTC Act, 15 U.S.C. §45. The companies failed to meet the FTC’s Green Guides and the FTC’s Enforcement Policy on Zero-VOC claims, and did so at their own peril. The Orders follow the Green Guides and the Enforcement Policy in that the companies cannot make unqualified zero-emission or zero-VOC claims unless the emissions and VOC content is actually zero (which is a difficult standard to meet), or the companies can meet the FTC’s de minimis standard, i.e., emissions and VOC content can be at trace levels. The FTC’s Enforcement Policy on Zero-VOC claims describes the “trace level” test a company must meet in order to make unqualified “zero” or “free-of” VOC claims: (1) VOCs have not been intentionally added to the product; (2) the presence of VOCs at that level does not cause material harm that consumers typically associate with VOCs, including but not limited to, harm to the environment or human health; and (3) the presence of VOCs at that level does not result in concentrations higher than would be found at background levels in the ambient air. The emphasis in the “trace level” test now seems to be on “emissions,” which is defined in the Orders as any compound that is emitted or produced during application, curing, or exposure of a covered product. Additionally, it appears that the FTC further refined the third criteria pertaining to background levels by specifying where the background level measurement should be, i.e., in a typical residential home, and how the measurement should be taken, i.e., without interior architectural coating. Providing third parties with the means of making false, unsubstantiated, or misleading representations about material facts regarding paints. In addition, the four companies must send letters to their distributors, instructing them to stop using existing marketing materials, and provide stickers or placards to correct misleading claims appearing on product packaging or labeling in order to correct existing unsubstantiated claims. Benjamin Moore and ICP Construction must also disclose that the environmental seals appearing in their promotional materials are their own in-house designations. It must be noted that if the FTC Commission finalizes the Orders, it plans to update the 2012 Sherwin-Williams Company and PPG Architectural Finishes Orders previously settled with the FTC over unsubstantiated zero-VOC and environmental benefit claims. The Federal Trade Commission has ruled that California Naturel, Inc. falsely advertised its sunscreen product as “all natural” in violation of the FTC Act. Despite the company’s “all natural claim,” the sunscreen contains 8% dimethicone, a synthetic substance. Last week, the Commission issued an order [PDF] prohibiting California Naturel from misrepresenting the ingredients or composition of its products, including whether the product is “all natural” or “100% natural” or any environmental or health benefits of the product. The company must have competent and reliable scientific evidence supporting its claims about the content and ingredients in its products. The Order also requires California Naturel to submit a report to the Commission, within 60 days, detailing its compliance with the Order. In April, we reported that the FTC proposed settlements with four other personal care product manufacturers and issued an administrative complaint to California Naturel for marketing sunscreen as “all natural” even though it contained dimethicone. California Naturel also advertised that it “uses only the purest, most luxurious and effective ingredients found in nature.” The company did not dispute that the product contained 8% dimethicone, nor that dimethicone is a synthetic ingredient. The Commission (except for Commissioner Ohlhausen, who dissented in part [PDF]) found that the disclaimer was not sufficiently conspicuous to change the overall message that the sunscreen is “all natural.” In particular, the Opinion criticized the disclaimer’s distance from the product’s “all natural” claims, noting that it was “not visible at all without scrolling down” and “well below the website’s ‘Add to Cart’ button so consumers are invited to purchase the product before they would even see the disclaimer.” FTC has previously issued guidance on online disclosures that urged marketers to place disclosures before “order now” or “add to shopping cart” links. All of the ingredients are in the same font and font size, and nothing on the face of the list identifies dimethicone as a synthetic ingredient. …If the cursor is properly positioned, this webpage identifies dimethicone as a “silicone-based polymer.” [I]t is reasonable for a consumer to rely on express claims, and thus that they should not be required to search for and dig out information that contradicts what an advertisement expressly and prominently conveys. Indeed, we expect consumers to rely on express statements such as the “all natural” representation at issue here, and to interpret such statements as meaning what they say. The Commission’s Opinion is a significant interpretation of the meaning of “all natural” claims, which are not addressed in FTC’s Green Guides guidance on environmental marketing. Here, the Commission cited court cases for the proposition that an “all natural” claim means that the product contains only ingredients found in nature. The Opinion also suggests that a properly qualified “natural,” or “92% natural” claim might have passed muster. http://verdantlaw.com/wp-content/uploads/2015/01/VerdantLogoWhite2-300x59.png 0 0 Verdant Law http://verdantlaw.com/wp-content/uploads/2015/01/VerdantLogoWhite2-300x59.png Verdant Law2016-12-12 16:42:122016-12-12 16:43:27FTC rules on advertising sunscreen as "all natural." Supreme Court denial upholds FTC on substantiating claims in advertising. Green marketers take note: the Federal Trade Commission (FTC) won a recent victory at the Supreme Court on deceptive advertising, which means companies cannot advertise health benefits for their products without sufficient evidence. On May 2, the Supreme Court denied POM Wonderful’s petition for certiorari, bringing to an end a six-year-long wrangle with the FTC over advertisements that claimed the company’s pomegranate juice was clinically proven as effective in fighting heart disease, prostate cancer, and erectile dysfunction. The Supreme Court’s denial leaves in place the January 2015 decision [PDF] from the D.C. Circuit Court of Appeals, which upheld the Commission’s decision that POM misled consumers in violation of the FTC Act. Specifically, the D.C. Circuit upheld the Commission’s findings as to (1) establishment and efficacy claims made in POM’s advertising, as well as (2) inadequate substantiation for those claims. The D.C. Circuit also affirmed the FTC’s cease and desist order [PDF], which requires POM to substantiate any future disease treatment and prevention claims with at least one randomized, well-controlled human trial, while other health benefit claims must be supported by competent and reliable scientific evidence. http://verdantlaw.com/wp-content/uploads/2015/01/VerdantLogoWhite2-300x59.png 0 0 Verdant Law http://verdantlaw.com/wp-content/uploads/2015/01/VerdantLogoWhite2-300x59.png Verdant Law2016-05-13 12:04:292016-05-13 22:27:09Supreme Court denial upholds FTC on substantiating claims in advertising. FTC enforces on “all natural” claims in personal care products. Today, the Federal Trade Commission (FTC) announced proposed settlement agreements and consent orders with four companies for falsely marketing shampoos, sunscreen, and skincare products as “all natural” or “100% natural.” A fifth company was issued an administrative complaint for marketing “all natural sunscreen” that contains “a synthetic ingredient,” dimethicone. Other ingredients cited as “synthetic” by the FTC in the proposed consent orders include ethylhexyl glycol, phenoxyethanol, polyethylene, polyquaternium-37, polyquaternium-7, and caprylyl glycol. The complaints against all five companies allege that using such “synthetic” ingredients renders “all natural” claims false or misleading. The environmental or health benefits of the product. Notably, today’s actions are not accompanied by an Enforcement Policy Statement or other guidance for companies not subject to the consent orders. FTC has raised questions in these enforcement actions such as: Which other commonly used ingredients in personal care products are “synthetic”? How does FTC determine whether a substance is “synthetic” or “natural”? Do plant-based versions of caprylyl glycol, for example, count as “synthetic”? Are processes and production considered as part of the “synthetic” vs. “natural” distinction, or just the sources or raw materials of the ingredients? “All natural” claims are particularly difficult to substantiate because such claims are interpreted by consumers in a variety of different ways, and the various federal agencies that have jurisdiction over such claims in the United States have not provided much clarity. When issuing the revised Green Guides in 2012, for example, the FTC declined to provide guidance on “all natural” claims, citing the lack of data on how consumers interpret such claims. A December 2015 survey [PDF] by Consumer Reports found that misunderstanding about the meaning of “natural” in the food world was widespread; more than 80% of shoppers thought that in the context of processed foods, “natural” meant no pesticides were applied in production, no chemicals were used in processing, and that the food contained no Genetically Modified Organisms (GMOs) or artificial ingredients or colors. Meanwhile, the Food and Drug Administration (FDA) is still collecting public comments, through May 10, 2016, on using the term “natural” in food labeling. http://verdantlaw.com/wp-content/uploads/2015/01/VerdantLogoWhite2-300x59.png 0 0 Verdant Law http://verdantlaw.com/wp-content/uploads/2015/01/VerdantLogoWhite2-300x59.png Verdant Law2016-04-12 13:56:352016-04-12 21:07:05FTC enforces on "all natural" claims in personal care products. FTC warns users and providers of environmental certification seals. Earlier this month, the Federal Trade Commission (FTC) sent warning letters to five providers of environmental certification seals and 32 businesses using those seals on their websites. The FTC is concerned that the seals may be deceptive according to Section 5 of the FTC Act, and may not comply with the agency’s environmental marketing guidelines, known as the “Green Guides.” The letters request that the recipients advise on what steps they are taking to bring their marketing into compliance. The agency is not disclosing the names of the companies that received the warning letters. Without careful qualification, general environmental benefit claims pose a risk of deception. Under the FTC Act, deception can occur inadvertently if the marketer does not have substantiation for consumers’ interpretations of claims. For example, if a product conveys an unqualified “eco-friendly” claim, and a consumer interprets that to mean that the product is carbon neutral and non-toxic, then the product maker may be on the hook for deception unless it has evidence to prove that the product is, in fact, carbon neutral and non-toxic. Companies can take steps to reduce the risk of deception. 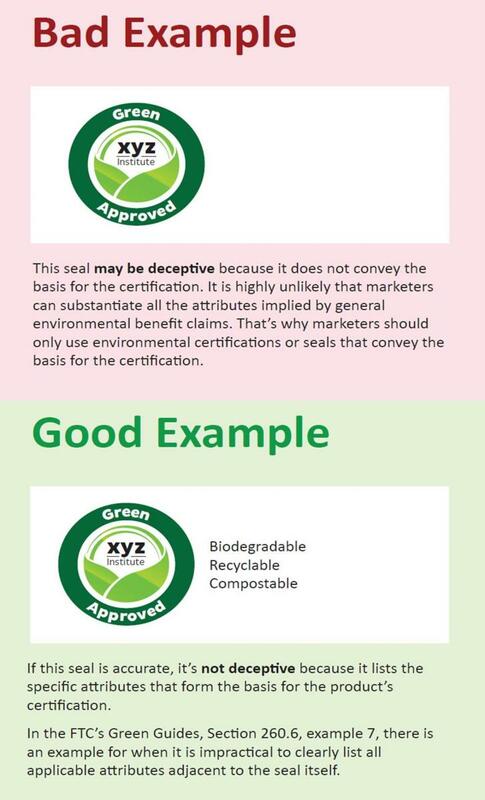 As discussed in the Green Guides, visuals like certification logos should be accompanied with “clear and prominent qualifying language that clearly conveys that the certification or seal refers only to specific and limited benefits.” In the “Good Example” of an environmental certification seal, for example, the words “Biodegradable,” “Recyclable,” and “Compostable,” are clearly displayed next to the certification logo. Logos themselves aren’t likely to be effective hyperlinks. Companies should not assume that readers will click on the logo image, and instead include explanatory information in large, easy-to-understand text, right next to the logo. In cases where not all attributes can be listed next to the seal, companies should display sufficient information upfront to explain why readers should click the clear and prominently placed link. Both the certifier and the advertiser have responsibilities under Section 5 of the FTC Act. In its letters to certifiers, the FTC notes that the certifiers’ websites do not appear to provide instructions to marketers on using qualifying language. The FTC has not determined whether the letter recipients’ claims violate the law and is not taking any law enforcement actions at this time. http://verdantlaw.com/wp-content/uploads/2015/01/VerdantLogoWhite2-300x59.png 0 0 Verdant Law http://verdantlaw.com/wp-content/uploads/2015/01/VerdantLogoWhite2-300x59.png Verdant Law2015-09-28 12:23:432015-09-28 19:27:35FTC warns users and providers of environmental certification seals. FTC brings enforcement actions for biodegradability claims. Last week, the Federal Trade Commission (FTC) announced enforcement actions against six companies for misleading and unsubstantiated environmental marketing claims. Five of the enforcement actions concern biodegradability claims for plastics, while the sixth relates to a company’s alleged violation of a consent order prohibiting making green claims for its paper plates and bags. These actions follow FTC’s July settlements with three mattress manufacturers regarding unsupported “VOC-free” claims. Together, these cases demonstrate that the FTC highly prioritizes ensuring compliance with its revised Green Guides, the Commission’s guidelines for how companies should properly make environmental claims, and sheds some light on how FTC interprets some of the Green Guides’ provisions. This marks the first time the FTC has addressed claims for biodegradable plastic. In the plastics matters, FTC has filed complaints and proposed consent orders against four companies that make various plastic products – ranging from golf tees to shopping bags – and a fifth, ECM Biofilms, which sells plastic additives to product manufacturers, including to two of the other companies targeted by the FTC. In addition to various charges of misrepresentation related to the biodegradability claims, ECM Biofilms is also charged with providing customers and distributors with the means to deceive consumers by issuing its own “Certificates of Biodegradability.” Under the proposed consent orders, the companies face no fines but are barred from making biodegradability claims that are unsupported by competent and reliable scientific evidence. Notably, the consent orders state that ASTM D5511, a test standard commonly used in the industry, cannot be used to substantiate unqualified biodegradability claims or claims beyond the parameters of the test. FTC appears to believe that ASTM D5511 does not simulate the conditions in landfills or other disposal facilities. The consent orders, like the Green Guides, require that unqualified biodegradability claims must be supported by evidence that the product will completely decompose into elements found in nature within one year after customary disposal. Qualified biodegradability claims must include certain appropriate caveats, such as the time period required for a product to completely decompose in a landfill or other disposal environment near where potential consumers live. The consent agreement packages are subject to public comment through November 29, 2013. According to Plastics News, all of the companies have agreed to the settlements except ECM Biofilms, which maintains that tests show that plastics made with its additives will biodegrade in environments mimicking landfills. FTC has scheduled a hearing before an Administrative Law Judge for ECM Biofilms in June. In the sixth matter, FTC is seeking a $450,000 civil penalty against AJM Packaging Corporation, a manufacturer of paper products including plates, bags and napkins. The FTC’s complaint charges that AJM violated a 1994 consent order by failing to properly substantiate claims that its products were biodegradable, compostable, and/or recyclable. The settlement with AJM vacates the prior consent order and enters a new one reflecting the updates to the Green Guides and requiring AJM to disclose certain information needed to qualify certain green claims. http://verdantlaw.com/wp-content/uploads/2015/01/VerdantLogoWhite2-300x59.png 0 0 Verdant Law http://verdantlaw.com/wp-content/uploads/2015/01/VerdantLogoWhite2-300x59.png Verdant Law2013-11-06 07:27:502013-11-06 07:27:50FTC brings enforcement actions for biodegradability claims.